In the manner of Schleiermacher’s fashionable friends, a new wave of intellectual despisers has taken the stage in our own time with an acerbic critique of religion, its adherents and the ‘charlatans’ who shape it. In the view of thinkers like Richard Dawkins, Sam Harris, Daniel Dennett, Victor Stenger and Christopher Hitchens, religion is counter-evolutionary, neither adaptive nor morally purposive. They argue that as human culture becomes more scientifically enlightened and as the need for metaphysical answers to life’s great mysteries fades, religion will likewise vanish from the scene. Schleiermacher’s ‘one question’ seems particularly appropriate, given the ‘straw-man’ character of the attacks advanced by the new atheists. Their narrow critiques tend to target religion as it was in the medieval or early modern periods or as it is in its current fundamentalist and extremist manifestations. As their approach is polemical, they do not venture into thoughtful dialogue with religious experts. Ironically, many of the most knowledgeable thinkers on religion today would willingly acknowledge the validity of atheist critiques of hoary religious institutional structures, anti-science fundamentalisms and reprehensible ‘sacred’ violence. At the same time, however, the true experts understand that religion and spirituality evolve. diﬃcult, but by no means impossible. One simply needs to know where and how to look for the signs of progressive change. Three thousand years ago, a careful observer would have found little reason to expect a radical reshaping of the religious landscape. In the great cultural centers of the ancient world—the Middle East, Greece, India and China—aggression and war were ascendant and the human condition was largely viewed as ‘agonistic,’ inextricably bound up in conflict. Religious energies were focused primarily on sacrifice; only the ruler had any assurance of afterlife; and ethical and spiritual concerns were only beginning to find expression in peripheral cults. Yet, what many now regard as the most significant evolutionary shift in the prehistory and history of religion and spirituality was about to unfold. In my book on cultural evolution, thriving in the Crosscurrent: Clarity and Hope in a Time of Cultural Sea Change (2010), I noted the religious and spiritual metamorphosis that was just getting underway three millennia ago and the pioneering scholar who first described its course. In this age were born the fundamental categories within which we still think today, and the beginnings of the world religions, by which human beings still live, were created. The step into universality was taken in every sense. Karen Armstrong’s The Great Transformation: The Beginning of Our Religious Traditions offers a rich and insightful account of the Axial revolution as the tumultuous period in which the world’s great religions arose. The Axial Age was one of the most seminal periods of intellectual, psychological, philosophical and religious change in recorded history; there would be nothing comparable until the Great Western Transformation, which created our own scientific and technological modernity. But the Axial transformation, like all great cultural evolutionary advances, was eventually diminished as many of its revolutionary insights crystallized into institutional inflexibilities and dogmatic certainties. The progress that had been made was not really lost; the best of the first millennium BCE still resonates in the spiritual excellences of the world’s great traditions. Sadly, most of the Axial energy for evolutionary change dissipated with the passage of time. Humankind unknowingly awaited a new revolution: a reawakening of the values that gave birth to the great spiritual traditions and the rise of a new wave of cultural evolutionary enrichment. In Thriving in the Crosscurrent, I argued that we are living in an age of dramatically accelerated cultural evolution. Such transitions—I call them ‘sea changes’ — are powerful and progressive unfoldings, marked by the movement of humankind’s dominant values toward a closer fit with reality. Sea changes affect almost every dimension of human experience and endeavor and they are extremely rare. In Thriving, I suggest that the religious and spiritual expression of the current cultural evolutionary sea change can best be understood as a Second Axial Age. The first was marked by the emergence of individual consciousness, making it possible for humans to step forth from purely tribal existence. The Second is giving rise to a new global consciousness. Still acutely aware of our individual existence, we begin to recognize our roles as global beings. The great theologian Ewert Cousins, one of the first to explore the idea of a Second Axial turning, emphasized its global character. Jim Kenney (3 o’clock) with members of the Peace Council, Hyun-Kyung Chung (1 o’clock) and Mairead Maguire (Northern Ireland Nobel Laureate at 11 o’clock). Today we are amid a second Axial Age and are undergoing a period of transition similar to that of the first Axial Age… All over the world, people are struggling with these new conditions and have been forced to reassess their religious traditions, which were designed for a very different type of society. They are finding that the old forms of faith no longer work for them; they cannot provide the enlightenment and consolation that human beings seem to need. As a result, men and women are trying to find new ways of being religious. Like the reformers and prophets of the first Axial Age, they are attempting to build upon the insights of the past in a way that will take human beings forward into the new world they have created for themselves. Karen Armstrong, one of the most respected chroniclers of the great religions, also sees the signs and calls attention to the continuity of the Second Axial with the first. The flowering of a Second Axial Age could mean the most remarkable evolutionary advance in the human search for meaning since the birth of the great religions in the first millennium BCE. But how can we be certain that such a transformation is actually underway, that ours is indeed a time on the cusp? Is there a cogent response to the new ‘cultured despisers’ of religion—those who imagine that uncritical dogmatism, rabid intolerance, rejection of science, and fanatical violence represent the authentic character of human religiosity? What might the critics discover if they responded to Schleiermacher’s gentle prompting and entered into dialogue with those who have real insight into the human spiritual quest? Might they begin to suspect that religion and spirituality truly do evolve? The following section briefly outlines a possible answer to these several questions in the form of four organizing themes and sixteen emerging evolutionary dynamics. These Axial markers are already beginning to guide a new generation of religious and spiritual inquiry, expression and action. As we reflect on them, each one opens a new window onto our radically changing cultural landscape. The old ‘nature or nurture?’ controversy points up one of the most important synergies in human social existence: the tempering of biology by culture. Biological evolution equips us for self-defense against the stranger, altruism toward the kin group and exploitation of resources. Culture, on the other hand, expands our horizons and deepens our insight and, in the process, alters our behavioral patterns by changing our working understandings of ‘stranger,’ ‘kin’ and ‘resource.’ Since some of humankind’s earliest religious questions addressed our relationships to the outsider, the group and the environment, it’s unsurprising that any cultural evolutionary advance would produce new insights and new behaviors with respect to these critical dimensions of existence. The first Axial Age, for example, gave rise to human ethical concerns, notions of social justice and reverence for the Earth. Appropriately, the first three Second Axial themes address these essential relationships. The first category of 21st-century evolutionary development has to do with our broadening and deepening relationships with ‘the other.’ The second is an extension of the first, shaped by new understandings of peace and justice as critical religious concerns. The third addresses our deepening understanding of our responsibility to the Earth and the entire planetary community. The fourth theme has to do with the recognition of the vast global landscape of spiritual practice and possibility. Perhaps the greatest of the first Axial breakthroughs was the discovery of the personal spiritual path and the rich variety of its tracings. 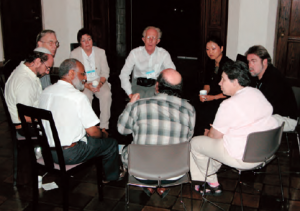 The Second Axial finds its sacred signature in what the late interfaith pioneer Brother Wayne Teasdale described as ‘interspirituality…an attempt to make available to everyone all the forms the spiritual journey assumes.’ The Second Axial reawakening of the inner life, it would seem, has a distinctively intercultural flavor. The following list of Axial themes and markers is neither definitive nor exhaustive. Each theme represents one of the most important domains of 21st-century religious and spiritual advance; each marker points up a particular evolutionary shift that is already well underway. It’s perhaps most useful to think of this compilation as a guide for reflection, a map of critical action areas, and—above all—an invitation to further exploration. Life in a period of powerful evolutionary advance is never easy but always energizing. And riding the new wave in is always preferable to washing out with the old. As each of the emerging Axial currents intensifies, whirlpools of resistance form and strengthen. These counter-evolutionary ‘eddies’ are energized by attachment to older value structures and fear of newer ones. They attend every significant cultural evolutionary wave, churning up destructive turbulence but never reversing the prevailing flow. Today, the most dangerous eddy is extremist fundamentalism, materializing in some form in most of the world’s great religions. As frightening as it is, however, fundamentalism is unlikely to resist the surging global information flow, the tide of generational metamorphosis and the rise of the Axial free thinkers. And, of course, as visionaries and activists continue to imagine and to serve, the transformative momentum of the Second Axial surge will prove irreversible.